Stop this annoying popup for WIFI security app that keeps recuring! 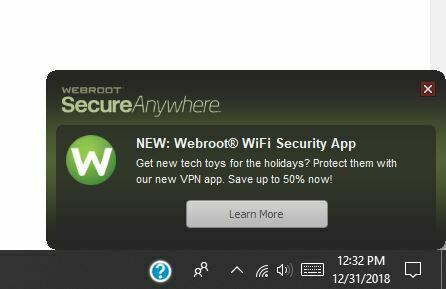 I didn't pay for this annoyance & if you don't get rid of it I will not be renewing any Webroot products. Apologies @driver_27 - I suspect that you have uploaded a screenshot, but it has been held for moderation as you are a new user, and I cannot see it. Our Community staff are enjoying a well deserved break until the New Year. If the pop up is the screen where you accept the EULA every time you login then this is a known issue and our developers already have a fix ready which will be released shortly after the holidays. The decision was taken not to release just before Christmas in case of issues (especially as some app stores do not allow even bug fixes to be published over the Christmas period). If it is another pop up - such as the warning about insecure WiFi - then this can probably be controlled by settings. If you could let me know which message you are getting and the platform (Windows, Mac, Android, iOS) then I will try and help you resolve this. It's an annoying advertisement popup that keeps recurring even after I close it. Two hours later it will intrude on my desktop again. It has been going on for a week now & I am fed up with it. @driver_27 I completely understand the frustration this is causing you and can only apologise for the inconvenience. As this isn't part of the WiFi Security product I cannot personally resolve your issue, but I will refer it on to colleagues and ensure that this is resolved as soon as possible. @driver_27 I have spoken to colleagues on the appropriate team. This is not intended behaviour and is believed to be a bug involving caching of the campaign messages. It is being actively worked on. 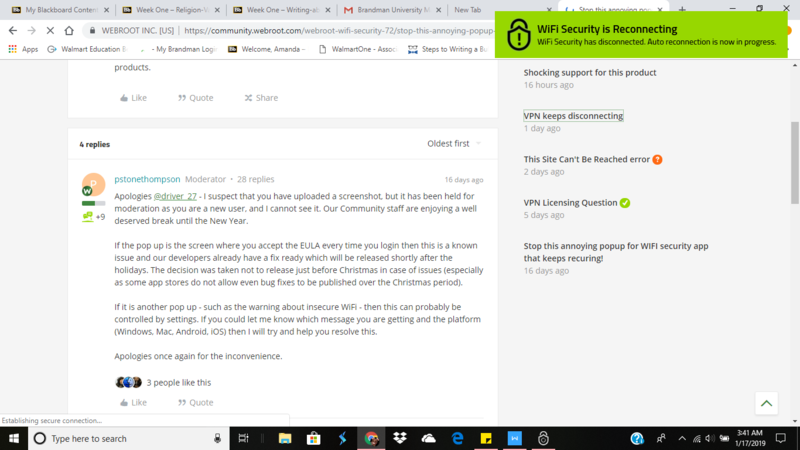 @MandiKae I believe that there was an update to Webroot WiFi Security for Windows this week (see https://community.webroot.com/webroot-wifi-security-72/vpn-keeps-disconnecting-336205#post336982) which has resolved this issue. The VPN is now much more tolerant to brief network interruptions. Can you let me know which version you have installed? Wanted to check-in with you about this. How's everything going now?